The Getaway Shows are South Africa's leading travel, outdoor and adventure consumer exhibitions and take place in Somerset West in March and Johannesburg in August. The Cape Getaway Show attracts around 17 000 travel and outdoor enthusiasts and took place at Lourensford Wine Estate during the second weekend of March. The show is literally the personification of the Getaway Magazine and visitors come in search of inspiration for their next holiday, to take advantage of the great show specials on offer and make purchases from the over 200 premium travel, outdoor and adventure brands on offer. ECTOUR's member associations were well represented with both Wild Coast and Kouga Baviaans Surf and Safari (KBSS) exhibiting and the Tsitsikamma and Karoo Heartland being presented by individual memebers. 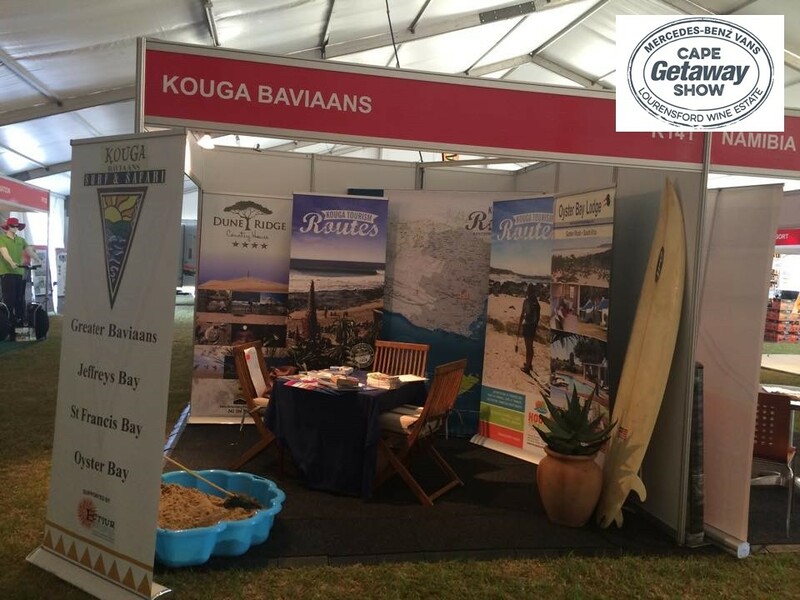 The big news of the weekend was the announcement that Kouga Baviaans Surf and Safari Country stand took the runner up position in the Best Destination category at the Friday night Exhibitor's Function. KBSS chairperson, Sandy Cunningham, of Brisan on the Canals in St Francis Bay could not contain her excitement at the news. "This is the first time that Kouga Baviaans Surf and Safari Country exhibited at any of these shows and it was amazing to get this kind of recognition. We were blown away by the interest shown especially in the Baviaanskloof and it is clear that South African's are looking for that off the beaten track destination that the area offers. It was also noticeable how little people knew of the coastal area from Jeffreys Bay through St Francis to Oyster Bay and people could not believe how much the area actually has to offer. The Chokka Trail in particular caught the attention of many visitors to the stand while it is clear that people are starting to look for experiences rather than just a place to visit and stay at". ECTOUR CEO, Jonker Fourie, who was also present at the show, echoed Cunningham's sentiments and observations. "The Kouga Baviaans association is still fairly young and does not have a large membership as yet. Imagine if they did, how much more they could have stood out and appealed to the Cape Town market", Fourie said. He feels that this accomplishment and recognition would go a long way to assist the association recruit new members especially with the view that after this success they are keen to take a stand at the Gauteng Getaway Show in Johannesburg in August as well. Products interested in joining Kouga Baviaans Surf and Safari Country, can contact Sandy via her contact details in the Information section of the KBSS website.